Recently, my husband and I celebrated our 14 year wedding anniversary. Like many others, I posted a few pictures from that special day. However, this made me think. The first day of marriage is hardly a picture of marriage. A then-and-now shot shows life's physical changes over the years, but leaves out what really shaped the marriage to that point. Looking back through our pictures, I kept having the thoughts, "I looked so young!" In most of the pictures I looked like I didn't have a care in the world. I was so excited at the thousands of possibilities life was getting ready to open up for us. I was blessed to marry my high school sweetheart. We dated off and on for 7 years before getting married after college graduation. But that's where the photos end. The pictures of the car wreck from the drunk driver who hit me head-on one evening coming home from work, a mere 6 months into our married. Or the land that we purchased that next month to build our first house. You will never see that the first year of our marriage was one of the hardest ever for me, Although we had dated for several years and felt like we knew each other very well, learning to live with someone and leaving home presented a host of challenges and emotions I was not fully prepared for. The wedding pictures didn't show that the next Valentine's Day we found out we were expecting our first child. And coincidentally, we had just started building our home. It didn't show the long hours of hard labor my husband and father put into building that house. Or the crazy, stressful time a pipe ruptured at the road during building and flooded the foundation. This in turn had my husband and I (very pregnant by the way) along with my parents, out there moving blocks and hauling sand. It didn't show how the night they put me in the hospital to have our first child, he scooted the couch he was sleeping on over beside my bed and held my hand during what little sleep we actually got that night. After the baby came, a new struggle came. Would I return to work, or stay home? Never once during the entire pregnancy had I considered staying home, but then I held my baby in my arms... the struggle is real. On our wedding day we had no idea that in a little over 2 years, we'd finally be out of our apartment, have a new baby, and I would begin the life of a work-at-home mom. We really had no clue that 2 years after our first child, I would decide to go back to work for a few brief months of juggling schedules, only to find out our second child was on the way! The sheer panic of a surprised pregnancy is not one that I ever imagined, yet I have experienced. For the first time in our marriage, both of us were completely speechless. From there we faced the financial struggles in marriage. Matt working long hours to make up for the fact that I no longer could work. We had many trials with the pregnancy, with several instances not knowing if she would live, including a hospital stay after her birth. We then were blessed as we shared great joy watching our young children experience many of their "firsts." Then God stepped in and changed the path of our marriage... We realized the Lord had called us into the ministry. That moment has been one of the most defining moments of our marriage. The adventure had only just begun! 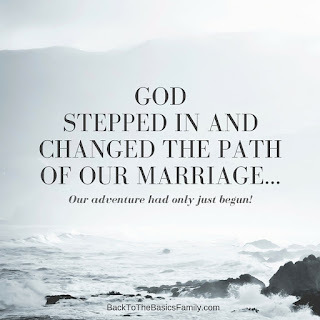 From there the Lord called us to family ministry and then to homeschool our children, and that has taken us down some many wonderful roads in our journey together. He has blessed us through the homeschool community and opened up doors of ministry. Most recently, these pictures leave out the amazing moments that the Lord has provided for our family. Through Matt's time of unemployment for various reasons in less than a year, plus STILL providing a means to pay for his final semester of college. He has taught us He is faithful, time and time again. There have been many more wonderful moments in our fourteen years of marriage that were never even given a thought on our wedding day. A true beginning, but oh the journey it has been to get where we are today! Life does give us some hard roads we must travel, including the pain of losing precious grandparents in our journey together. We have also ventured through some hard roads with our health. These have been times of growing and learning for us, but through it all, the Lord has always been with us. Now, when I look at our wedding pictures, I see a slight glimmer of what the future holds for two young people so deeply in love. A beginning of a love story... a ministry on the verge of being birthed... lives forever changed.